The Funky Felter: Do you like a good deal? Here's a great place to get online craft coupons! Do you like a good deal? Here's a great place to get online craft coupons! In this economy (and really any other time! ), I like to get a good deal, or at least save a little here and there when possible. This has prompted me to search out online coupons. I use to subscribe to the Sunday paper and clip coupons, but we've since let our subscription go so now I search the web for free online coupon sources. As an artist and crafter, I usually visit Michael's, Hobby Lobby, or JoAnn's stores once a week to browse the isles and see what the latest trends are. Now I go prepared with coupons just in case anything strikes my fancy, and I want to make a purchase right then. At the beginning of the week, I print my coupons and carry them in my purse so that they are handy. I don't always use them, but they are nice to have just in case. That brings me to the site that I wanted to share. Some of you savy shoppers might already know about it, but if you don't, it is a great resource for finding the latest crafty coupons. 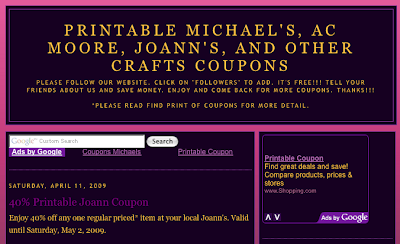 At MyCraftyCoupons.com, there are postings with online coupon links for many popular arts and crafts stores. I personally visit the site weekly now and have come to appreciate the quick and easy access to so many coupon links in one place. A big thanks to the site proprieter Celesteina for updating the site with wonderful discounts! If you like a good deal, go check it out. Hey, this is a GREAT tip! Thank you so much! That is an awesome site! Thank you for sharing~! !